I love reading posts about products bloggers love – from lip gloss to cleaning supplies. Here are a random mix of food items that have impressed me lately. I recently bought a container of this Noosa yogurt – made in Colorado but inspired by “the finest yoghurt from Australia.” I noticed its pretty package, which led me to pick it up and I found a flavored yogurt with a simple ingredient list and only 9 grams of sugar. Made from grass-fed milk too! I pretty much exclusively eat plain yogurt (except for Siggi’s and the occasional flavored something-or-other) so I decided to give it a taste for something different. It’s a full-fat yogurt with raspberry fruit on the bottom. Upon first taste I was HOOKED – soooooo incredibly good. The yogurt part alone tasted like cream and the raspberry puree just added that much more. Velvety indeed. I didn’t eat this like I would my regular yogurts covered in fruit and crunch. Rather I savored it spoonful by spoonful for a light snack or dessert. I hope to try another flavor soon! My future brother-in-law’s sister (so does that maker her a future sister-in-law? 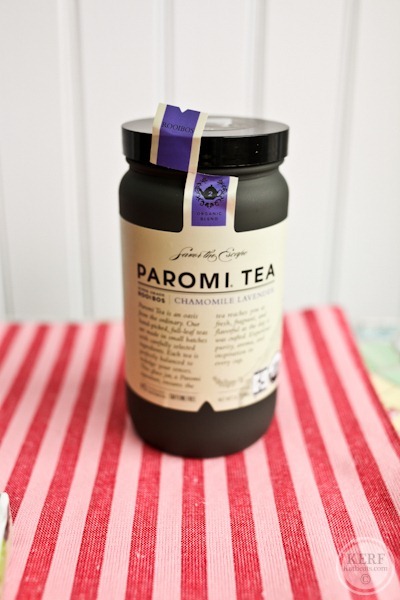 ), Chelsea, works for Paromi Teas and gave us each a few flavors for Christmas. I’m just now to the end of my Chamomile Lavender and will be buying more [they have it at Whole Foods]. I just love this with frothed milk and a touch of Stevia in the Raw. Great anytime of day because it’s caffeine free. 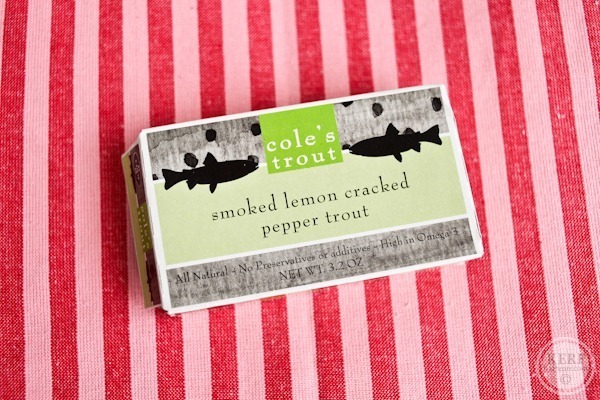 I found this new flavor of smoked trout at Relay Foods: Cole’s Trout. It was kind of like a cross between the lemony sardines I used to buy and the plain smoked trout from Trader Joe’s. Thumbs up for taste!! The company is earth friendly too. I’m going to look for the sardines and mackerel as well. 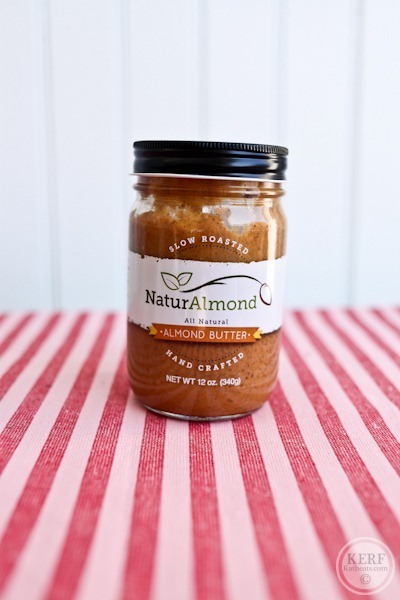 In my Favorite Nut Butters post, a few of you mentioned NaturAlmond. I have steered away from accepting products to review regularly, but when the owner of the company offered to send me a jar I couldn’t say no! These chips. Are awesome. That’s all! I bought everything in this post except the NaturAlmond. And the tea, which was a Christmas gift. I’ve seen that Noosa yogurt at Target and always wondered about it. I’ll have to pick some up next time. good to know, ill be looking for it there also. I saw those chips but they also have it in black bean. Trying to change up my Sweet Katen’s nacho se so I do t get bored. Also I found a new snack/treat. Hope I’m getting the name right… Smoked salmon candy. Or Candy salmon? Picked it up from whole foods. Smoked salmon that almost tastes like ham or bacon! BACON!! So instead of picking up the regular chips or Girl Scout cookies I pick this up. Oh wow – gotta look for that! My Whole Foods sells that, too. Delicious! My sister raves about an ahi tuna “jerkey” and a salmon jerkey, probably not the same as above product but there is a kind at whole foods for $$$ and at trader joes for $. I love posts like these too!! Mmm, sweet potato tortilla chips, a must buy! There’s a guy at this farmers market that does almond butter like that. It can be so hard to get the consistency right but when you find a good one, you’ve gotta stick with it! I can’t wait for market season to begin! This brand has the best sweet potato tortilla chips I’ve ever tasted! I know I haven’t tried all the brands, but I would say I have sampled 5+ brands, and this was far and away the best! Glad to see that Noosa has made it that far east! The farm and family live close to me and I mountainbike with the owner quite often. It’s pretty incredible yogurt. Yummy!! I love sweet potato anything! Try the Strawberry Rhubarb flavor, my favorite! I’ve seen that yogurt before and always thought it looked so decadent and delicious. Glad to know it is! Ella, how about making your own? It is super easy and cheap. Just roast 400g almonds at 200c until fragrant and slightly browned. Let cool. Reserve a handfull, throw the rest in your mixer and spin until you have a runny butter. Add the last handfull and give it a last spin, that will add crunch. Season with sea salt and, if you want, a little brown sugar. Delish! OMG, that yogurt is so cute! It looks super yummy, too. And those chips? They look dangerous ;). Those would not last long in my home! Fun post! I’ve heard great things about that Noosa yogurt as well–but I don’t think the Whole Foods closest to me carries it actually (bummer). And love the packaging of that almond butter as well, it sounds great, and I don’t even tend to be an AB fan. Do you eat the sweet potato chips with salsa, on there own, with another dip? I had to give up the Noosa as I had a hard time eating just one serving from the container. It is a great dessert. The Noosa yogurt is very good. Target and Whole Foods handle it here. I like to add nuts. It’s a good topping on oatmeal too. Thanks for this post! It is always fun to try new things, especially when they have been reviewed and recommended by someone else beforehand, so there isn’t as much ‘risk’ in trying something new. I don’t eat fish, but I love the packaging for the trout. I’m all about that shabby chic sort of look with packaging – bring on the burlap, kraft paper, glass, neutrals, twine, and glass. Very cool. I love these kind of posts too! Thanks for sharing! Is the Fresh Market in your area a chain? I went to one in Roseville, CA (where I’m living now!) the other day. It was a VERY nice store and I think I saw it was a chain based out of NC. I am a fan of those sweet potato chips, too! slightly addictive . . . Thank you for pointing this out! I’m always looking for the lowest sugar yogurt option for my son. This sounded good when Kath said only 9 grams, however, that’s for just 4 ounces. 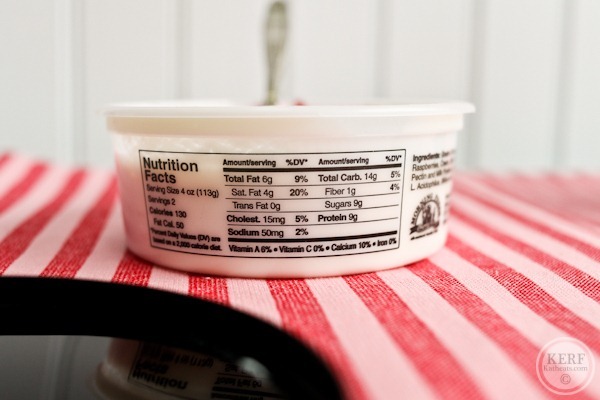 A regular size serving of this yogurt has just as much sugar as other brands. We noticed these recently, too and gave them a try. Most yogurts are 6 oz with >20 g sugar, so this is still not as bad. My husband and I split one and the serving size was fine for us with some homemade granola. I would add that they are quite expensive, too. many yogurt cups are 4-6oz for a serving. portion control definitely still applies when you’re talking about flavored yogurts! I am on the zero tolerance line with sugar intake, so I opt for a greek yogurt & fruit purée (with no added sugar). Kids love it as well. It is just hard to stop eating this when you have to open the whole container. I wish they had packaged it in 1 serving container because once I open it……. I think I’ll give Noosa a try. I feel like the only person who doesn’t like yogurt! I give it a try every few months or so. Sweet potato corn chips are addicting! I’ve seen Noosa yogurt around but never thought to pick it up, now I’m going to have to! I actually tried (and loved) Siggi’s because of your blog! I live in Colorado and have seen Noosa around but I’ve never tried it. I had no idea it was made here. I’m pretty sure it’s going to have to go on the list after reading how delightful it was. I adore those sweet potato chips too!!! I LOVE Noosa 🙂 I also really enjoy the Honey and Blueberry flavors. I will also mix a little bit of it in with my overnight oats. I’m a big Noosa fan. It’s lighter than greek yogurt and so smooth. You might like the honey and peach flavors too. I like the raspberry but wish they would strain some of the seeds out of it. They used to package it in slightly larger containers but now they only package it in the smaller size. Can I add that I really like the new colors and fonts that you are using – it’s really makes the site look fresh! We LOVE Noosa at my house! I live near where it is made and we can get it in larger sizes still. Check with where you buy it and see if they can order it in the larger size. I agree it is a bit expensive but for the low number of ingredients, whole milk from pastured cows, local and downright DELICIOUS so worth it. We usually make our own yogurt from Morning Fresh milk as we don’t always drink the milk we get delivered fast enough and it is cheaper. I admit I was suckered in to buying Noosa yogurt because of the packaging, but it is soooo goooooood! The mango flavor is delicious. love THESE kind of posts kath! I discovered Noosa when I lived in Colorado a few years ago. I will agree that it is probably the BEST yogurt I have ever eaten. The peach flavor is fantastic and tastes like summer. My favorite is definitely the raspberry though. It is the one yogurt that you def dont want to cover up with “extra” toppings. Unfortunately, I no longer eat it since I have to take about 3 digestive enzymes in order to be able to tolerate the lactose. 🙁 So sad. I recently moved to Colorado, and people are OBSESSED with Noosa out here! I don’t eat dairy so I haven’t tried it, but evidently every flavor is amazing. Full-fat yogurt is SOOOO good. 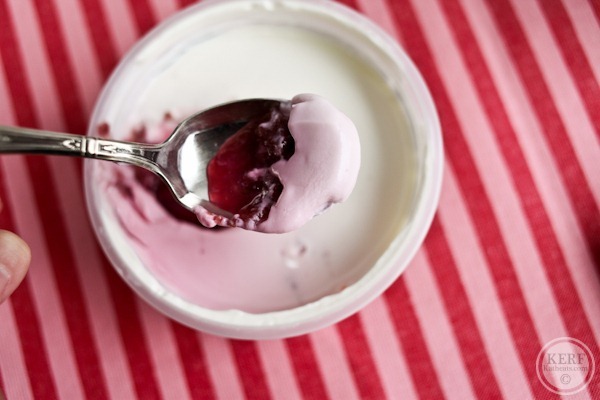 My favorites are Trader Joes Greek Style Honey and the new-ish Simplait yogurt from Yoplait. I think it has like 5-6 ingredients and it’s not too expensive. I’m going to have to try that yogurt, it reminds me of my beloved Fage yogurt! Definitely want to try out that yogurt – love that it’s from grass fed cows! Ohh Noosa!!! That stuff is just–AMAZING! It reminds me so much of the yogurt I grew up eating in Argentina, and it’s probably the closest thing to the real stuff that I’ve come across. (Noosa is kinda pricey though :P) And that Paromi tea sounds interesting and the packaging is so cute. Can you buy that yogurt at any grocery store, or did you buy it at a specific store? It looks so yummy and creamy! I love noosa so much! Their honey yogurt is divine, and I simply adore their blueberry! I’ve been loving the brown cow cream top greek style yogurt lately. It’s not high-protein like other greek style yogurts, but it is SO creamy and rich! Wow! I don’t eat dairy so this yogurt doesn’t appeal to me, but I noticed that this 8 oz. container contains 12 grams of fat and most importantly 8 grams of those are saturated – seems quite high for a healthy snack, no? Noosa is delicious! My one criticism of that product is that container is two servings. It is too good and i just keep eating til it is gone! 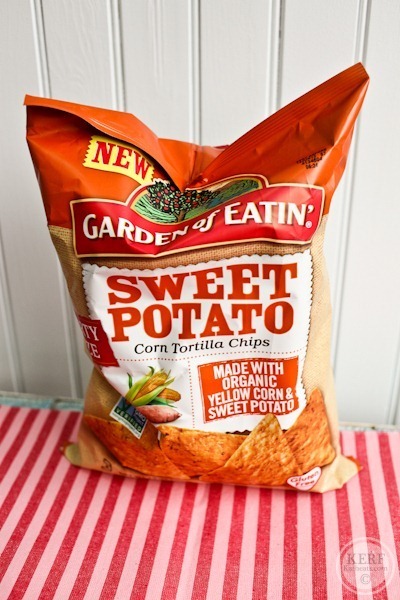 I love garden of eatin chips, especially sweet potato, they are so tasty! I heard they are working on a plain variety keep an eye out! 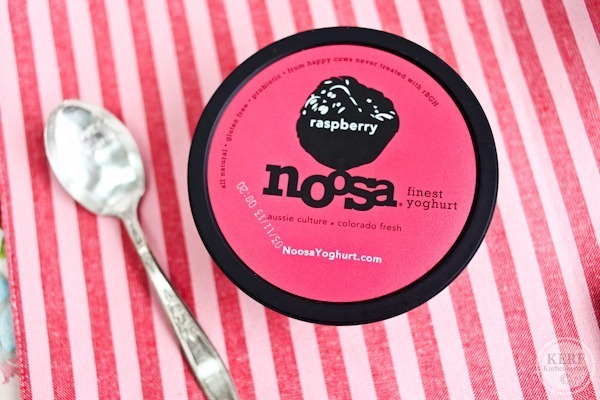 Thanks for writing about the Noosa Yogurt! 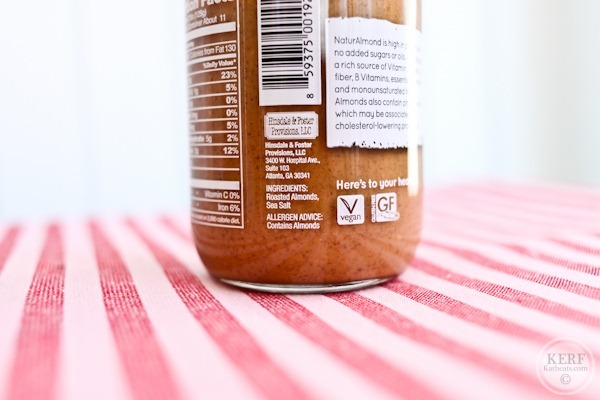 I have seen it many times and was curious about it – I will definitely pick some up next time I am at the grocery! Those chips look great! I am typically not a fan of sweet potato chips, but I am a fan of fries! Alexia’s are the best, but homemade is also great! Noosa is good – and has even made it all the way to Target in South Carolina. I do wish they had a plain flavor (or maybe they do and my store just doesn’t carry it). I find the fruit ones to be to sweet and end up eating around the blueberry, strawberry, rhubarb or whatever. The strawberry rhubarb Noosa is out of this world delicious! LOVE Noosa yogurt! It is more like a treat than yogurt 🙂 So good. Sadly, I have only tried one of these items, the Garden of Eatin’ Chips. LOVE them! Since they are not blue, it easier to get my five year old and his buddies to eat them too! Now to try the Noosa! Have passed it over quite a few times. You say the texture is velvety, but is it thick like Greek, or thin like traditional, or somewhere in the middle? Dumb question: How is it his grandfather’s recipe if it is just almonds and salt? Noosa!!! My favorites are Peach and Strawberry Rhubarb. I once considered using it in my OOs, but couldn’t bring myself to do it since, as you mentioned, the best part is the creamy deliciousness of the yoghurt. I want that almond butter right neow! Sweet potato chips – I need those! those chips are possibly my favorite chips. top three, for sure. i randomly bought them one time to have with white chicken chili, and they blew me away. i’m glad you wrote about that yogurt! we sell it at target, and i always want to know more about it. i’ll have to give it a go! Read your blog this morning, went to Whole Foods at lunch and bought a bag of those sweet potato tortilla chips. Oh my! I knew I shouldn’t have bought the bag because I have no self control and its half gone. The chips are thick and crunchy and great on their own! Or with some black bean and corn salsa, I can’t stop…addicting! Thanks for the recommendation! I have been eyeing up those yogurts for weeks now. Time to try it for myself. I really like when bloggers do these kind of posts. Always such a fun way to find some new treats. I am confused though about you not doing formal reviews but still accepting products? And then to say that it’s good, isn’t that the same thing? Anyway, other than that I liked the post and will check for that yogurt! I’m not focusing on product reviews or seeking them out – I turn most things down. But like I said in this post, I couldn’t resist trying this one. And just like my diet in general, I don’t like to put labels on things or create rules. I probably shouldn’t have even shared my goals/focus in the first place because now y’all are questioning everything! Gosh, Kath, I don’t think we all are questioning everything. You made some changes to your blog and lots of people have complimented you on the new format. But it’s natural for readers to wonder about the blog’s direction when there is a real disconnect between your stated goals/focus and the new material that you are generating. That’s all. PS. — I l-o-v-e those chips! With the greatest of respect, Kath – our questioning of some of your recent judgments is not out of line. Why should you feel threatened by your readers holding you accountable, or reflexively take the position that your mistake was in being transparent? As a professional, you should embrace accountability and push back. You might view such criticism as helpful (and praise those who point out inconsistencies) as opposed to going on the defense or completely ignoring those who don’t simply gush re. you and your lifestyle. Admitting you were wrong is tremendously freeing and would go a long way in building good will. Perhaps they are “questioning everything” because they are devoted readers and you offered up the information. I don’t think there is anything wrong with questioning. I would think that it would be a good thing to have readers who are insightful and intelligent enough to bring these kind of conversations to the table. Product reviews/sponsored are a hot topic on blogs right now. It isn’t just you/your blog readers are questioning. I actually think it’s good to have some healthy debate here. As readers, we really do respect you and I think respecting your readers opinions – even if they challenge you – is like serving the “customers” of your business, which is what this blog is. It all helps to continually improve the blog, I think! Best of luck as you navigate the changes! I definitely didn’t mean to offend you. I am just curious what the difference between a formal review and taking a product for free and then saying that you like it. I’ve been a reader for a really long time and, in general, like where the blog is going these days. I feel that at times you can be a bit contradictory so I was just looking for further clarification, not a defensive response. I looooove those chips. And I also love seeing what products other bloggers are loving. I hope there’s more to come! I need to get my hands on that yogurty deliciousness. And how can i resist that almond butter!!!! I WISH we had that yogurt in Australia! It looks so good! Sweet potato tortilla chips sound incredilicious! The yoghurt is available in Australia 🙂 It originated in Maroochydore on the Sunshine Coast in Queensland (i.e. just up the road from “Noosa”). My mum has worked for the company for 10 years and the original developers/owners took it to the states under the Noosa label. It’s available to buy all over Queensland and northern NSW. Here it is known as the Queensland Yoghurt Company. Same recipe as far as I know 🙂 Although by looking at the raspberry puree in Kath’s post, I think the purees probably differ (our’s look better!!). I generally check CHO vs portion (6 oz standard) for yogurt analysis…for DM education anyways. Otherwise I will confess to only checking food labels (for personal use) to ensure high calorie content when I need it. Oh my gosh, I love Noosa! Try the Strawberry Rhubarb flavor if you can find it– it’s awesome! I recently tried Noosa too and LOVED it! It’s seriously like a dessert with how rich and creamy it is! I might even replace my ice cream snack some evenings! I noticed that in your “Lately” post, you did show the container of the Raspberry Noosa with banana, chia and coconut on top, but in this post, you said you wouldn’t put anything on it. Did you decide it’s better with toppings? I had mine plain, but maybe some crunch would be a nice addition? Which way did you prefer it? Also, I found I couldn’t eat the whole container because it was so rich. The serving size is half, which is where the 9g of sugar comes in. I had to balance mine out with a big serving of chicken avocado salad to get some more protein in so I didn’t get a sugar rush! Does anybody know what the Noosa makers mean by “inspired by the finest yogurt from Australia”? What is Australian yogurt? I really appreciate the fact that you are making an attempt to steer away from formal reviews. I cant even tell you all of the blogs I have read for years, that are suddenly pushing me away because their blog has turned into an advertising hub. I am constantly seeing their instagram filled with pictures of free clothes, shoes, and food followed by a post about it. Now, i am not sure why it is bothering me. Maybe its jealousy…but also i think that when you feel like you have formed a bond with the writer you feel like they are selling you out. Do you know what i mean? I love Noosa! I used to buy it all the time when I lived in CO 🙂 However, it is now a rare treat since I’ve removed dairy from my diet, but boy is it good! I’d choose that over ice cream any day! That tea sounds good… so does the Noosa! Did you drink tea at all while you were pregnant? I have been drinking a little of it. Those chips sound so good! I live 50 miles from a whole foods store but can’t wait to get the Coles products. You have me coninced they are going to be worth the drive! I love Garden of Eatin chips but I haven’t seen the sweet potato tortilla style…I’m on the look out now!! Great picks! I have seen that yogurt in Colorado for a while, but just recently noticed that it was at my Wegmans (in MD). It’s SO good! Sarah (Miss Smart!) sent me a bag of those sweet potato chips. They are really good- I have to use great restraint not to eat the whole bag at once! I saw sardines packed in marinara sauce on sale the other day. I was intrigued, but resisted. But, they immediately made me think of you! I love Noosa (and Siggi’s)! The hubster and I often share a small container for dessert and I put the honey flavor in my morning oats. So yummmm! Whoa. I need to go to the land of the Garden of Eatin’ and snag me a bag of those chips. They look real tasty ‘n stuff. And not sharing with my kids. Nope. They have greedy hoovers for mouths. The Noosa yogurt looks amazing- it’s incredible that it only has 9 grams of sugar. It looks so healthy and I’m sure it’s an amazing snack for kids! Just a heads up on the Noosa yoghurt. Their nutritional label is completely wrong. I had the Strawberry Rhubarb yoghurt the other day it lists 9g for sugar but it is actually 19g of sugar. It also has more fat than listed and less protein. Go to their website and click on the nutrition labels for each. Shocking. They sent me an email saying their tests were wrong and are correcting the labeling. I feel they should pull what is on the shelves until they do. Wasn’t sure about linking the letter they sent but if you want to see feel free to contact me. I can definitely go for the roasted almonds!